Mumbai, the home ground of Irani cafes and culinary fanatic Parsis, readies to judge a hospitality veteran on nostalgia. Phorum Dalal drops in for chai. Decades later, the restaurateur pays his tribute to a people who played an intrinsic role in lending Mumbai’s café culture its character, by opening the fifth branch of SodaWaterBottleOpenerwala (SBOW) at Bandra Kurla Complex. 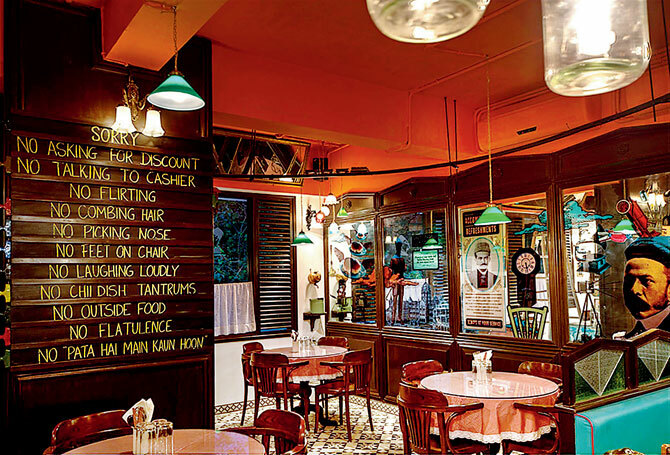 The name, also a surname among the Parsis (although often, it’s labeled fictitious), is archaic but Singh’s eatery is a contemporary version of the bun-maska-chai outlets that dotted every city turnaround after the 1950s. And this return to home is making him nervous. “Mumbai,” he admits, “will be the hardest market to please. We were worried even when we opened in Delhi since the capital had little exposure to Irani cafés and Parsi cuisine. But with that challenge overcome, we are ready now,” he smiles, sinking into a fuschia couch at his sea-facing Napean Sea Road apartment. In the last decade, Mumbai saw several of these cafés down shutters. Some owners said they were no longer commercially viable. Some fell victim to warring partners. When Irani chai and kheema pav lovers were sulking at their loss, Singh was plotting a way to carry the legacy forward. “The concept is uniquely Indian, and Irani joints have played an important role in the country’s culinary history,” Singh believes. He opened his first SBOW in Gurgaon in November 2012. Then came another in Khan Market. Outposts in Bengaluru and Hyderabad followed. Like its predecessors, the BKC outlet will serve Parsi staples patra-ni-machchi and dhansak, but offer a mix of Bombay street food, too. “Our best dishes include a version of Bhendi Bazaar’s famed seekh paratha and Willingdon Club’s eggs Kejriwal,” says Singh. His wife Sabina walks into the room in a breezy polka dress, and asks, “Chai?” Singh says he has ordered it, before she interrupts with, “and khari?”, referring to the chai’s iconic accompaniment, a flaky rectangular biscuit. The couple’s search for a Parsi manager hasn’t yielded results but at the helm of the kitchen is chef Anahita Dhody (with Kulbeer Rana). The menu encourages guests to mix and match. Singh’s favourite combination is berry pulao with Aunty’s aloo cutlet. Although he swears by Fort’s Britannia & Co.’s berry pulao, he is confident that his version is at par. “We’ve followed authentic recipes, although the presentation may be contemporary. Everyone’s mum makes the best dhansak, but to ensure that quality is maintained, we’ve roped in local Parsi caterers to regularly audit our food,” he says. Blogger Chowder Singh is the man behind planning the menu.